I was going to rate the various packages on accuracy but did not include accuracy considerations in my ratings since I am not absolutely sure which package results are accurate and which not. As noted below, CRA is doing some testing. All packages have received the Canada Revenue Agency's NETFILE certification. The winner by a good margin is UFile, which combines superb help, easy navigation, thoroughness and speedy operation with reasonable privacy and security. And I believe it provides the correct calculation of taxes, unlike some of the other packages. At $15.95 for one return, UFile isn't the cheapest but is good value for money. Honourable mention goes to three packages tied in second place: H&R Block, TaxChopper (formerly named CuteTax) and WebTax4U. H&R Block is a clone of UFile re-branded in different colours but with additional license conditions that I consider unwelcome. HRB's license gives it permission to bombard a user with marketing offerings, not just from itself but also from its 3rd party partners. HRB also shares data with its US parent, possibly resulting in data ending up in US government hands. 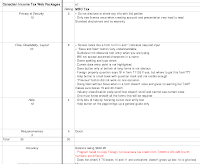 QuickTax Standard is a good package - you will be certain not to leave anything out - but it drove me nuts with its laborious one question at a time interview process combined with sluggish processing performance. It took me twice as long to complete my return with QT than any other package. QT is the package for the ultimate tax dummy, in the nice sense of the word, like the Dummy series books. QT also suffers from its constant pushing of other products in the corporate stable and the license allows for such marketing, including disclosure to 3rd parties. Opting out is possible but isn't a convenient process. The use of QT may also result in your data ending up in the USA and exposure to US laws. The packages below that in my rankings all are characterized by much more limited help and not quite as slick or intuitive or well explained user interfaces. I found myself clicking and scrolling back and forth too much, even though I knew exactly what I needed to do ... after the third or fourth entry of the same data, it should go more smoothly, right? Perhaps if you have a very straightforward return and know how the tax forms work inside out, they may be ok. Only one of these lower rated packages produced the same bottom line tax owing as the #1 package UFile and market leader Quicktax, which I guess are most likely to pan out as correct in the CRA testing. That was FileTaxOnline. 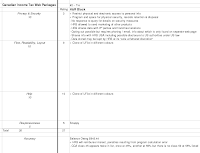 As I mentioned in my previous post Caution about Web Tax software, the different packages produced a wide range of taxes owing using the same input. I know I entered all the data because in every single package line 150 Total Income was identical. In every package but one - CuteTax which had a deduction at line 232 that none of the others did - they all had the same Net Income line 236 as well. The problem lies in the tax credit parts of the return. 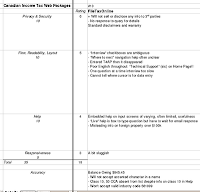 Several packages calculated no line 479 credits - eTax Canada and EachTax. 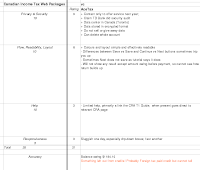 Others failed to give credits for Foreign Tax paid - WebTax4U and probably AceTax (I couldn't tell for sure since you don't see al the numbers till you pay and I'm too cheap to pay just to do a review). CRA was concerned when they heard what I had found and is now testing the packages to try replicating this. So stay tuned, when they get back to me I'll pass along what CRA says. 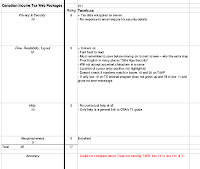 Prices and Possible Free Return Preparation - Wikipedia has a great list of all the packages together at Canadian Tax Preparation Software for Personal Use. Did you consider looking at Studio Tax? It seems to be a bit more advanced, but it's also free!. Hi Krispy, I would have tested it but there isn't a web version. If only CRA would pay me as a consultant I'd happily try to poke holes in the programs. I've used StudioTax for the last couple years and love it. It's easy to enter your information, and even easier to check through afterwards, as all the forms appear exactly like the paper versions. I have found many errors in the software over the years. Most packages do not handle foreign tax credits well. Studio tax did not handle child care expenses properly last year. I've been quite happy with uFile, having used it for years. Occasionally I run into some UI glitches (for instance, this year I had to enter my T5 information at least 5 times before it saved), but overall the program is very useful. Out of curiosity, how did you find those errors with Studio Tax relating to Child Care expenses? Are you knowledgeable enough to know they were wrong, or did the software help to point out the error at all? i think where Ufile shines most is in it's optimizations. especially for seniors where they can now split up to 50% of their pensions. studio tax may be free but you could be walking away from hundreds or thousands of dollars of extra refund by using it. so that's not really free is it? Geoff here from the QuickTax team. "If you are using the QuickTax online application, we encrypt your tax return information and store it safely on our secure servers, which reside in Canada. 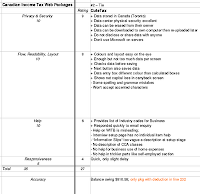 Intuit does not store any tax return information outside of Canada. Unless you give us specific consent, you are the only one who will have access to your own tax return information, subject to legislated exceptions." Always read your reviews of tax software, and appreciate your time and effort in this. It looks like the rating details link for AceTax is not correct, it is showing MBO Tax's rating when clicked instead of AceTax's. I don't tottaly agree about AceTax being rated #6, I would think it should at least at #3 just like last year's review. George, thanks for the note. MBO Tax was missing in the tied 7th position. 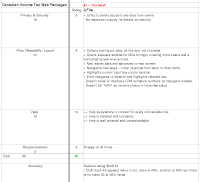 I've now added AceTax's chart that explains why I rated it as I did. This is Johnie Fredric from AceTax. Thank you for reviewing AceTax Online, just wanted to clear a few things out. The only pages that have the 'Save & Continue' button are the 'Personal Details', 'Spousal Details' and the 'Forms Selection' page. The reason for that is for faster navigation, when in those pages. All other forms and pages in AceTax Online only have the Previous and the Next button and they always save the current page you are on and move to the next or the previous page when clicked. We are working on building a better searchable help feature within AceTax Online. Most people who have given us their feedback have always appreciated the speed of the system. 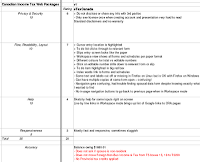 If you enter total income (line 150) less that $25,000, you can download the PDF file for free. Most Tax softwares you reviewed would do that, probalby that should have been your test case. We can also setup the Userid you setup with AceTax to by-pass the payment screen for your testing puposes. 1. A copy feature where the tax filer can copy their previous year's return to the current year. This is very much loved by all our customers, as most times only a few numbers change year to year. 2. If you are a returning customer, we appreciate that and give you a discounted price for the following years. The following letter is for praising Taxnic from a user. Your such kind of review seems not fair. I would just like to thank you for your tax software! income) with foreign taxes paid. 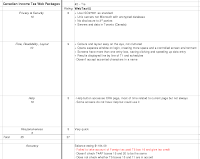 Taxnic.ca was the seventh tax software I tried this year and the first one that worked properly. I was already becoming totally depressed about the idea of needing to file my taxes using the paper forms, which I shouldn't need to do with all these CRA-certified tax programs around. You have saved my sanity! 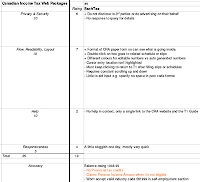 What makes Taxnic.ca so functional is the fact that it keeps the reporting of the income (in this case rental) separate from the foreign income forms and from calculations of the foreign tax credits. Therefore, when I am making a 20(12) deduction for the part of my foreign taxes that I cannot use for the foreign tax credits (I have confirmed this with CRA), I get all these calculations done with correct amounts [= minus the 20(12) deduction]. Please keep this like it is now for the coming years as well and you will be my choice forever! 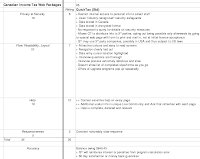 20(12) deductions and foreign tax credit calculations cannot be performed correctly.